Kays Kids: A touch of the sun. A touch of the sun. It was a lovely warm day, and Granny went down to see her grandsons, so of course I went as well. I though I needed a work out, I had been getting comments from you know who??? So I could eat more for lunch, I thought a few punches would be the right thing to do. Then I spied a pool. No way was I working out when I could relax. They have a beautiful pool and it was just the right day for it. After a great time on the water, I went for a swim, then I just chilled out reading a book in the shade. Now where is my lunch.." Honey Muffins will do fine thanks." Come to Australia to live. Beautiful one day and better the next. I will just have a snack of toast with peanut butter and honey for supper. This is a picture of Adelaide at sunset after a beautiful day. This clever lady comes from the Netherlands and is very creative making Bunnies, Teddies and Cats. is the nut behind the steering wheel." Oh, we are in for a wintery stormy night, rain turning to snow and high wind. We will soon be all tucked in for the night. I can relate to this bear, this is exactly why my weight loss has been slower than I had hoped. LOL He looks like he knows how to relax well. Huh, we see grey outside here, we're moving, pronto! Glad you got some rest after the hard workout ;-). You don't want to overexert yourself. The picture of the sunset is simply stunning. It looks like a postcard. om heerlijk te gaan genieten. ligbed, "Life is Good" en zo is het precies. een boek lezen en wat lekkers eten. Jaaaaa Wilbur , jij geniet en dat is fijn!!! How cool! I would also like you rested! I am still amazed that we are at opposite ends of the world...and you are in Autumn and we are in Spring!!! lovely photos Kay!!!! What a fun post! Wish it were that warm here. 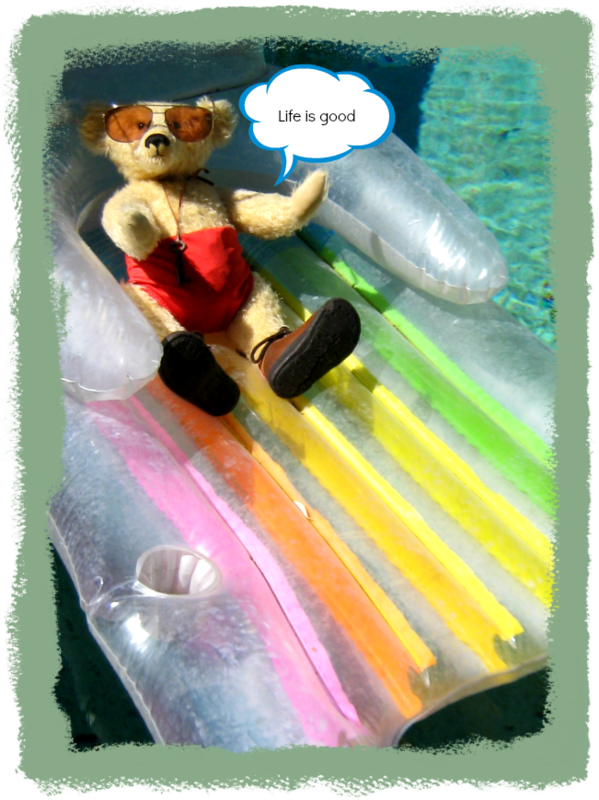 Oh... what a wonderful life... a pool in the garden and relax zones... oh, I come to visit you!!! what a pool day with an breathtaking sunset! Wonderful. What an amazing sunset and such a beautiful photo with the swans on the lake. Looks like a lovely day visiting your Grandsons and what a gorgeous pool - looks like the perfect way to relax in the sun. Autumn or Fall as we Canadians call it, is my favourite time of year! I see Granny is on Instagram now Wilbur. I'm looking forward to seeing lots of nice photos there. This is not my personal item but one of my boutique items for sale... Antique Gold Plated FIX 18K French Art Nouveau Rose Pendant. If you hover with your mouse over my comment above, you will see the hyperlink; just click on it!